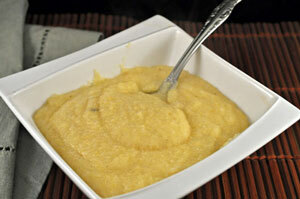 Savory, Creamy Parmesan Polenta, Thyme for Cooking easy side dishes. Add milk or stock, Parmesan and a pinch of nutmeg. Cover, keep warm and let sit 5 minutes. Serve.